The Tango-powered (and weirdly named) Phab 2 Pro wasn’t the only crazy phone on display at Lenovo’s Tech World today. 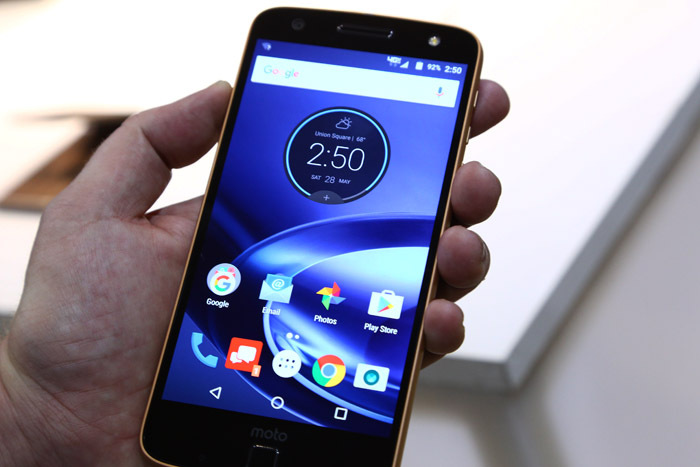 Joining it on stage was a new handset from Lenovo’s sister company, Motorola: the Moto Z, a modular smartphone that can use backpack-like accessories to double as everything from a small boombox to a portable projector. We only got a few minutes with the device, so we’ll hold our deeper impressions until we get a chance to give it a proper review… but at first glance: damn, it feels nice. Even ignoring the crazy accessory/modular stuff*, it’s a damned slick-looking and feeling phone. The OS is as speedy as you’d expect from a modern smartphone, the screen was bright and clear, and… really, it just felt damned nice in the hand. The projector accessory wasn’t mindblowingly bright — but even in a room that was about as bright as your average office, you could make out the image. In a properly darkened room, it should be just fine. The “fashion-focused” cases seemed… well, like cases — but they do a pretty good job of covering up the phone’s only real aesthetic shortcoming, which is the big ol’ rear camera hump that is becoming oh-so commonplace… so you might end up wanting one. The rest of the accessories, such as the JBL Boombox and the battery extender features, weren’t really built to be tested in a noisy conference hall in just a few minutes — so no comments there, yet.